The Delaware Art Museum is pleased to unveil its renovated and re-installed 18th- and 19th-Century American Art galleries — Galleries 1, 2, and 3 — to the public on Friday, November 28 from 10:00am-4:00pm. Just in time for the holiday season, the beautifully redesigned space will display over 50 works of art, including many permanent collection objects that have not been on view for over 10 years. As part of this re-installation, the galleries will highlight 150 years of portraiture, sculpture, landscape painting, still life, and history painting. "I am excited to be able to present our local Wilmington history within the context of the dynamic national art scene," explains Heather Campbell Coyle, Curator of American Art at the Delaware Art Museum. "The product of more than two years of research and planning, the redesigned space gives us the opportunity to showcase the Museum's outstanding collection of American art to the local community, visitors, and school groups in new and exciting ways." The first gallery presents portraits that span 1757 through 1856, featuring familiar favorites by Benjamin West (1738-1820), Thomas Sully (1783-1872), and Raphaelle Peale (1774-1825). Two images of Delawarean women, five-year-old Anna Walraven (1846-1927) and Sally Ann Ross Paynter (1812-1866), will also be on view. These portraits, all produced within a 50-mile radius of the Delaware Art Museum, reflect the aspirations and accomplishments of local families. The second gallery introduces landscape painting, which became very popular during the mid-1800s. 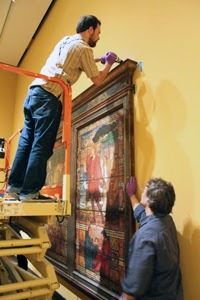 The loan of Michele Felice Cornè's romantic overmantel painting (circa 1800), which hung at Mount Cuba Center in recent decades, provides a prelude to the meticulous landscape paintings of the Hudson River School. These evocative landscapes are joined by history paintings, sculptures, and a luscious still life by Severin Roesen (1815-1872). In the third gallery, the story of landscape painting continues with works by George Inness (1825-1894) and John Twachtman (1853-1902), which now hang near an early painting by Robert Henri (1865-1929) and a pair of etchings by Thomas Moran (1837-1926) and local printmaker Robert Shaw (1859-1912). 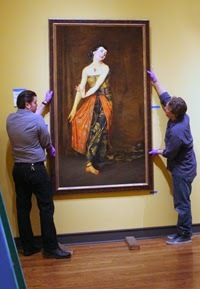 One wall has been hung salon-style, creating an interesting juxtaposition of 16 works of art from the Museum's 12,500-object permanent collection and select loans. In November 2013, the Museum underwent a major renovation and reinstallation of its gallery dedicated to contemporary American art, which nearly doubled the amount of objects on view from the permanent collection. The reinterpretation of the permanent collection galleries allows the Museum to find new ways to present its history and material culture to visitors of all ages.